This is the third post about the Cambridge Academy, a private English program for junior and senior high school students. You can read the introductory post here, and the six-month update here. The Academy started in April 2015, so this is the eleventh month of operation. It seems like a good point to review the year and talk about what we have learned since the last update. There have been several positive developments. Best, and most important, of all is that our current students still seem to be enjoying their classes and reading well as far as I can tell. We have a range of outcomes depending on motivation, how often the students miss class, and ability, but even the least motivated students have read around 40,000 words this year. The students I mentioned in the last update who had run into problems now seem to be back on track. We have figured out what to do with intermediate students. 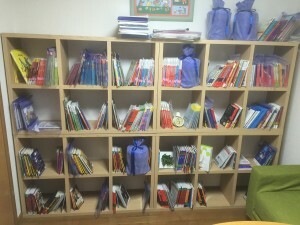 Once students go past YL 1.0 we class them as intermediate and give them more freedom to choose books. Up until 1.0 we do ‘guided ER’: class teachers give them their reading material and keep track of what they have read. 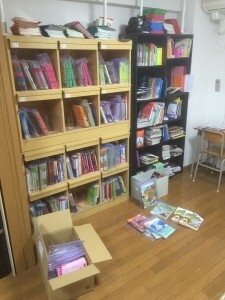 Once they become intermediate they can choose their own books (teachers give advice until they get used to taking responsibility for their reading) within an appropriate level range. The tape is easily available on Amazon or in stores. 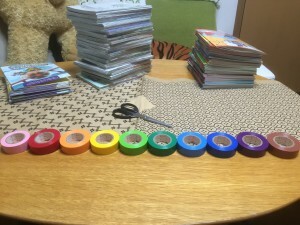 Putting it on books and ziplock bags is a bit of a pain, but it really helps teachers put beginner sets back in the right place quickly, and students find books at an appropriate level in the intermediate levels. The reason I use tape and not stickers, despite the extra time it takes to measure and cut the tape, is that it is far more durable and pretty much doesn’t fall off (unlike the stickers). We had some very good explanatory sessions with parents and students (sanshamendan) where we asked parents to come in for fifteen minutes and gave them a quick status report on how their child was doing. I was able to share their reading numbers and talk about what we do in class. This also gave parents a chance to ask questions or raise concerns, and a few of them did which meant we were able to set their minds at ease. We did the sessions over a number of weeks in November and December. I’m not sure if we will be able to continue doing them if student numbers grow, but will try to do something similar at least for all students in their first year. We have bought a lot more books. We took delivery of about 1000 in January, and I am nowhere near caught up on labeling them and sorting out the audio. The good thing is that I think we’re probably okay for breadth at the beginner levels now. The next thing is to work on the intermediate levels, particularly on getting really appealing series of books, so that students can find something they like and read lots of similar content. Somewhat predictably, we are still finding it hard to recruit students from outside of Cambridge English, the parent English school. I was hoping to have grown the student body to around one hundred by the end of this first year, but instead we have seen slight attrition as students quit to focus on entry tests, move away, or get busy with other activities. Student numbers fell by about 15% as current students decided they didn’t like the new system (fair enough as most of them were in normal eikaiwa classes when we unilaterally moved them to the new Academy format). We have another 10% or so who will graduate and go away to university. Somewhat making up for that, we have up to 40% who will come up from Cambridge English, and about 10% of new students who have booked trial lessons this month. If all goes very well, we should end up with slightly more students than we had this time last year. We weren’t able to redesign the website last year so that is a future project. Well, the most urgent thing right now is to make sure the current students stay and as many prospective new students as possible join. We also need to tweak the program slightly to move writing practice into the ‘output’ classes and reduce the amount of formal homework students have. This year we found that most students did not do homework, which interfered with the smooth running of classes. Next year we will have no set homework but instead introduce lots of opportunities for language practice so that more motivated students can do it and the others don’t feel they have to. I am really looking forward to seeing the students’ progress going forward. We have half a dozen now who are into our intermediate level, having read 300,000 words+. I am hoping that we (and they) will start seeing results in terms of their school studies and general English proficiency. This is where the program is going to live or die, and where our future students are going to come from. It will also make all the hard work worthwhile. This is so exciting to hear about! I admire you for making the ER commitment, and I am carefully reading everything you have written. What I would really love to see is a list of the titles in your library. I don’t know how you monitor/track the student reading choices, but it would also be interesting to hear about which books/series are most popular or most appropriate. 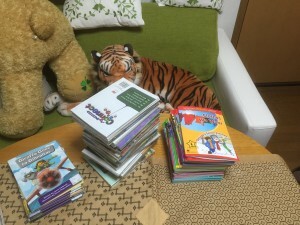 I would like to expand my ER library for use with upper elementary students, and I would like to make the reading of books in the library to be more of a requirement. As it stands, library use is voluntary, so some people take advantage of the resource, and others never look at it. I think I need to instill a lifestyle/pattern of regular reading in elementary school students so that more can become voluntary library users. Perhaps my decision to make reading a student-led experience, while idealistically the preferable approach, is naive. The families where parents take an active role in library usage are producing thriving readers, but students who lack such supportive family structures would benefit from a teacher creating a more structured system and giving them leadership. But, if I change the system, I also have to consider which texts are available with audio components because some of the students have serious visual perceptual issues that put them on a much slower trajectory. I would like them to benefit from reading, too, as an extensive listening experience, rather than force them to get books that are much lower in vocabulary and grammatical structures than would be appropriate for their actual level of comprehension. Please keep writing about your program. You are showing me how it can be done, and that makes me want to do more in my own school. Thanks for the post idea! I will definitely do a list of titles/series at some point. My goal is to have audio for every single book in our beginner section (~YL1.0) and we’re most of the way there. My experience with university, high school, junior high school, and elementary students is that if they don’t read in class (even if it is just for ten minutes) they don’t read. Adults can do it if they are motivated, but only very special younger students (or, more likely, ones with active parents). I enjoyed this update. We are listening. Really interesting. Thank you so much for sharing. All reading in my school is heavily controlled by me. I would love to introduce something similar to this. Thanks for all the food for thought!